The AirWay product line allows small businesses and home offices the wireless freedom they need to get their job done. Wireless Handsets give users key system features with the benefit of wireless, they no longer need to be chained to their desks while awaiting an important call. Because it is wireless, the system is very easy to install and maintain. There is no need to punch holes in walls or to string cable and wires. The system is also portable, so if you move out of your current space you just pack the system up, and your investment is never left behind. 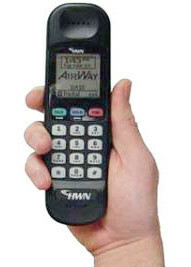 The AirWay system makes key system functionality affordable for the small business. 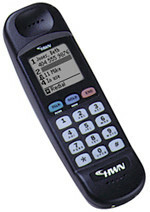 Now an employee can access up to four incoming/outgoing telephone lines on any wireless Handset. 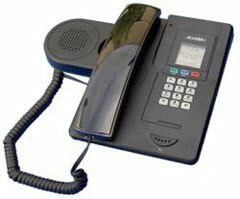 Each Handset comes with a large screen LCD making Caller ID (available on every line) very easy to read. Interactive menus help users find the specific feature they are looking for. 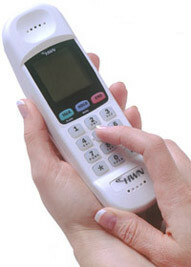 The Handset supports call transfer, call conference, call rollover and call privacy, to name a few. 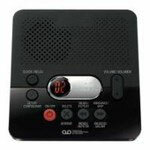 Accepts virtually any audio source such as: digital player, radio, CD player, PC sound card , etc. Superior sound quality with any external audio source. Size: 8.5" x 4.75" x 2.25"
Size: 6.75" x 2" x 1.25"
Size: 4.5" x 2.75" x 1.25"